Elizabeth Beaumont teaches in the Politics Department at the University of California, Santa Cruz, where she is the Director of the UCSC Legal Studies Program. Her book, pictured above, expands our understanding of the Constitution. Specifically, she demonstrates two important things about our Constitution that we either didn't know in the first place, or that we have improvidently forgotten. First, the "Constitution" upon which we rely to preserve and protect our individual rights, and that establishes our democratic political and governmental system, was not issued as a finished product by the generally older white men who gathered in the Philadelphia Convention in 1787. In fact, prior to ratification, there were major political debates in virtually all the states, and the proposed text was found lacking by many. The Constitution, as ultimately ratified, reflects and incorporates the changes demanded by civic groups, from North to South, which mobilized, and argued, and transformed the Constitution, particularly by demanding the inclusion of a Bill of Rights. Second, our "Constitution," as we know it today, was not a finished product when the Constitution was ratified in 1789. In fact, "the modern Constitution has been refounded by abolitionists and suffragists who initiated valuable transformations in the original constitutional framework, above all the boundaries of fundamental rights and citizenship." Democratic self-government, in other words, as secured by our Constitution, is not something that was simply handed down to us by those "Founding Fathers" we learn about. Democratic self-government, and the Constitution which secures it to us, is the product of political agitation and organizing that extended for almost two hundred years after 1789. Ordinary men and women (and particularly women), have brought us to where we are. 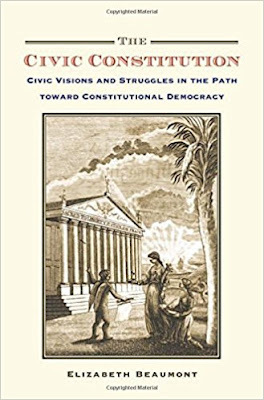 The implicit lesson of Beaumont's book is that our "Civic Constitution" will only endure, and continue to secure our democracy, to the extent that we, today, continue the kind of political work that Beaumont demonstrates has shaped our nation, and its Constitution, in the past. The story of the United States Constitution is richer, and more inspiring, than the simple story we learn about the Philadelphia Convention. It is a story that should make us proud, and that should inspire us to maintain the kind of civic struggles that are, in the end, the real guarantee of liberty and freedom.